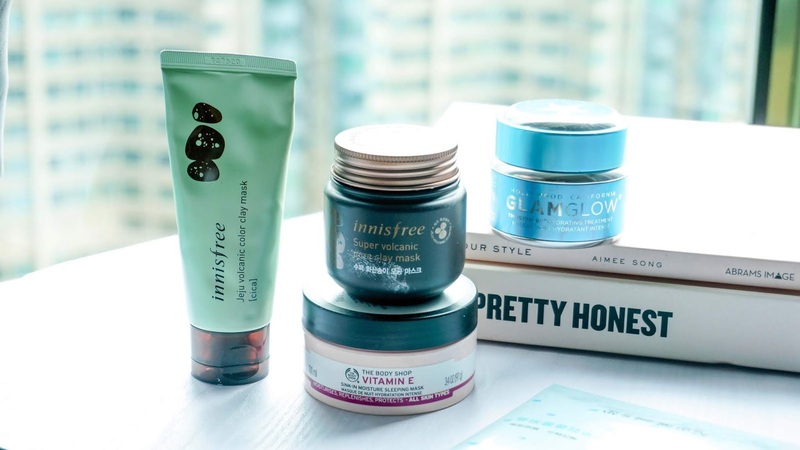 I love doing these posts sharing my weekly mask favourites. I have a lot and there is a lot that I left behind in the UK. These past two weeks my skin is going through a change getting used to the humidity and the constant in and out of the air con situation. To helps breakouts, restore hydration and soothe my skin I have been using the following. For clay masks, my holy grail is the Innisfree Super Volcanic Clay Mask which really helps to draw out impurities. I picked up their new colour clay masks and I have been using 'Cica' which helps with blemishes, it's like a cream clay mask and it makes my skin feel like a babies bottom. It does make me look a bit scary though (think Fiona from Shrek). With these colour masks, you can multi-mask which I can't wait to try when I pick up new variations. For sheet masks which I put on in the morning and evening depending on my skin situation. I have used the Beauty Diary Hyaluronic Mask which is for hydration, an Innisfree aloe vera mask to help soothe my skin and Innisfree Bamboo to restore moisture and soothe. For sleeping masks which are so handy to give you that extra hydration and barrier against the air con, I love using The Body Shop Vitamin E Sleeping Mask which has a jelly like consistency. I wake up with soothed and hydrated skin and makes makeup application so much smoother. Another favourite is the Glamglow Thirsty Mud Hydrating Treatment. This one does has s little tingly feeling and smells wonderfully of coconuts. This ones gives me more hydration than The Body Shop and can be used as a quick 15-minute mask. I do have a few more masks waiting to be used what masks have you been using? I haven't tried any of these masks, but I do love Glam Glow in general. I'm always looking for more masks to use. I also love Origins charcoal and hydration masks. They're lightweight and very effective. I love the Hydramud its so good whenever i use it i feel so hydrated its great. I really want to try InnisFree. I love using the Avene Soothing Moisture Mask overnight.